The Economist recently compared Venezuela to Zimbabwe under Mugabe, but a fairer comparison of regions of the country might be made with Somalia. Of course, this is splitting hairs: there’s certainly no doubt that Venezuela, once considered the only “First World Country” of Latin America, is increasingly looking like the worst-case African catastrophes. First, and perhaps, most significantly, there’s the looming electrical blackout of the country. The shutting down of the Guri Dam’s hydroelectric system which provides some 60% of the nation’s energy is just days away as I write on April 1, 2016—and this is no April Fool’s joke. The real April Fool’s joke was headlined in Correo del Orinoco, the official government paper, today: “[President] Maduro Approves Plans to Strengthen the Country’s Fishing Fleet.” Given Venezuela’s incalculable debt, one wonders where the 2 million Euros to buy new boats will come from since the government, which has taken over responsibility for 50% of the nation’s imports over recent years, can’t seem to keep the pharmacies stocked with necessary medicines nor the supermarkets stocked with food. Of course, even if there were food in the supermarkets, 87% of Venezuelans say their salaries aren’t enough to pay for basic food items and 81% of Venezuelans are “showing some signs of poverty.” That’s another major problem: it now requires a year-and-a-half of minimum-wage salaries to feed a family of five for a month. But the real joke is that the country’s largest body of fresh water, the Guri Reservoir, might soon not have enough water to float any boats in—assuming Maduro would ever come through on the promise to buy them. But the punchline is left out of this joke: there’s no mention of the impending need to shut down the turbines of the Guri Dam in the Correo del Orinoco. Along with all the other problems facing the country, it’s simply… not mentioned. To find out about the impending collapse of the electrical system, one would have to go to the ever-shrinking independent press. And that’s a whole other story. On March 30, journalists and other media workers protested all over Venezuela against censorship and the closing of independent daily newspapers. They pointed out that twenty-one dailies have closed down in Venezuela in the three years since Maduro has been president. And when there is no independent press, critical information about the poor, inept, or non-existent performance of the government, of course, goes unreported. So, for instance, no one hears about the fact that “Eternal Commander” Hugo Chávez knew about the impending electrical shortages in 2002, and never did anything to address the problems, nor has Maduro after him (See Damian Prat, Guayana: El Milagro al Revés (Caracas: Editorial Alfa, 2012), Chapter Nine). Billions of dollars were spent on power plants that were either never installed, poorly installed, misplaced (yes, that’s correct, some went “missing”) or never even delivered. As was often the case with Chávez, thousands of promises and no follow-through. There are the brave journalists and publishers who dare report on government misdeeds, irresponsibility, corruption, and complicity in crimes, and get the story out even when the government is depriving them of newsprint (since the government now is in charge of importing newsprint, which it distributes at its discretion, of course). And then come the reprisals for their work: Witness the case of David Natera, publisher of the Correo de Caroni. Residents in the area of Sifontes, near the contested zone bordering on Guyana, claim that 28 miners were murdered on the evening of March 4, 2016 by a gang led by “El Topo” (The Mole). “El Topo” is the nickname of Jamilton Andrés Ulloa Suárez, an Ecuadoran miner-turned-gangster who lives from “taxes” (around 50% of the take, in fact) on local miners in the shadowy world of the gold mining, and in some cases evidently directly controls the mining itself. The bodies of the victims were reportedly then brought through town, escorted by a truck of the largest national police force, the Cuerpo de Investigaciones Científicas, Penales y Criminalísticas, CICPC, and then past three military checkpoints where there were reports of the presence of Bolivarian Intelligence (SEBIN) officers. According to some eyewitness reports, some of the bodies had been sawn up by chainsaws, and the miners, and others (including women cooking for the miners, and moto-taxi drivers) had been killed with shots in the back of the head. 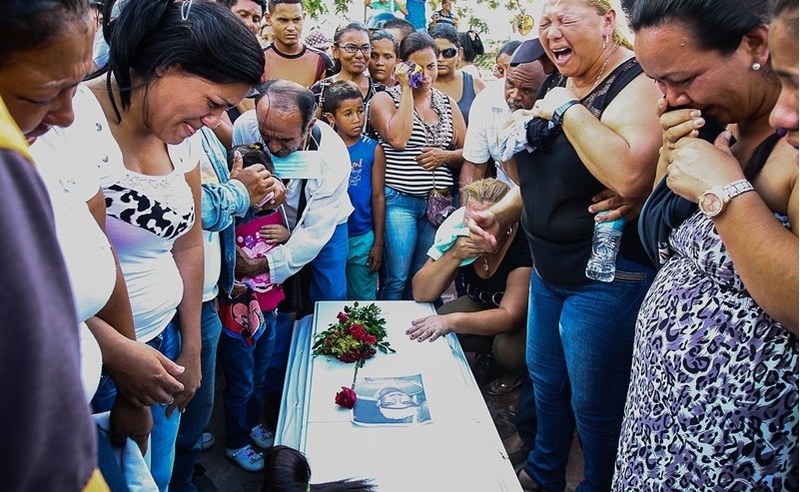 Telesur offered a sparse five-paragraph story after 17 of the bodies were recovered, under the title “Venezuela: Miners Killed in Dispute with Paramilitary Units.” The headline is controversial in at least two respects. Given that the murdered miners were murdered execution style, all with shots to the head, all with their hands tied behind them, the idea of a “dispute” and exchange of hostilities is inappropriate. Secondly, calling the murderers “paramilitary units” is ingenuous at best, and more appropriately manipulative, fitting the killings into the government narrative that attributes the country’s problems external forces or internal “fifth columns:” the (U.S.) imperialists, the internal “oligarchy” or, in this case, the Colombian paramilitaries supposedly operating in the country. This narrative breaks down, however, with Tumeremo. One has only to look at a map to find Tumeremo, Bolívar in the far east of the country, nearest to Guayana, and not too far away from Brazil. For the Bolivarian narrative about “paramilitaries” in “dispute” in Tumeremo to have any credibility, the government would have to explain how (and why) such shadowy forces could have penetrated so far from the Colombian border and into the country without being detected by their “crack” police forces of the SEBIN and CICPC or the "glorious" FANB. The PSUV Governor of the State of Bolívar, Francisco Rangel Gómez, when first asked about the massacre adamantly denied it. “Absolutely nothing has happened,” he said, then he conceded that perhaps there had been an armed confrontation between gangs. He continued to deny anything had happened in the area for two days. Representatives of the national government also attempted to cover up and deny the massacre from the outset, from the first day when the residents of Tumeremo blockaded the main highway through the town. The military (FANB, Bolivarian National Armed Forces) has long been known to be in control of gold mining in the region, with a particularly powerful role granted it in 2010 when Chávez gave them “the task of stemming Venezuela’s growing problem with illegal mining activities in the south eastern part of Bolívar state.” That they are working closely with “prans” or Venezuelan gangs appears to be an open secret in the Bolivarian government, given the reports of complicity in the Tumeremo massacre between the CICPC, the SEBIN and the FANB, and the attempts of the Bolivarian government and its allies to sweep the massacre under the rug. On the other and, opposition National Assembly representatives from the region, especially left party La Causa R (LCR, The R(adical) Cause, an older independent opposition socialist party) members Américo De Grazia and Andrés Velásquez, have taken risks to publicize the massacre and bring the perpetrators to justice (De Grazia has received numerous death threats). They called on Governor Francisco Rangel Gómez to appear before the national Assembly on March 29th, but he refused, calling it a “media show.” But the real “media show” appears to be the government investigation of the massacre, which took ten days to go into the mines and recover the first seventeen bodies of the slain miners. Ten more bodies are reportedly somewhere down in the mines like Hoja de Lata (Milk Leaf), a mine under control of El Topo where four bodies were recovered and which Governor Rangel Gómez had just a few days before the massacre had qualified as “a model mine.” Governor Rangel Gómez himself has been regularly implicated in multiple and multifarious scandals from the “steel rod mafias” to overcharging for imports, etc. etc. In September 2014 De Grazia denounced Governor Rangel Gómez as being part of the “gold cartels” when he ordered the national guard into the Sifontes area (including Tumeremo) to rob gold buyers and sellers. De Grazia and Velásquez are backed by others in the opposition determined to get to the bottom of the massacre, and the ten other massacres (including one which took the lives of 80 Yanomamis) that have taken place over the course of as many years. But it appears they’ll have to fight the Bolivarian police, the intelligence services, the military, as well as the state and national governments to get there. Update: So far two lower ranking members of El Topo’s gang have been arrested, but there are apparently no indications that the government is interested in pursuing El Topo, even though Tumeremo residents say he’s hiding in the La Guarampín deposit in the Hoja de Lata sector. That same resident opined that “El Topo seems to have more power than the government.” He certainly appears to be under its protection. Mother of a murdered miner. What is that first paragrap? It's dreadful. I mean is there any meaningful way in which Venezuela is actually like Somalia, other than you think they are both bad? They don't seem at all similar to me, and there's no attempt at substantiation. And how is it splitting hairs to pick Zimbabwe or Somalia as your comparison, they're very different countries with different problems. Or is all of Africa basically just interchangeable? There are reasonable critiques to make of the PSUV, but this article has no critical analysis or insight, I don't understand why the admins have featured it.